Today Saint John’s Imperial Theatre announced a great new show coming this fall. Tickets go on sale tomorrow, Thursday September 7th at 10 am for Canada, It’s Complicated, a new production created by Mary Walsh (This Hour Has 22 Minutes, CODCO). Featuring sketches and satirical songs that examine the joys, foibles, tragedies, and triumphs of Canada, the show was written by some of the country’s leading comedians, musicians, and playwrights. It stars a diverse cast of young, up-and-coming performers and is staged as a truly unique multimedia stage experience. 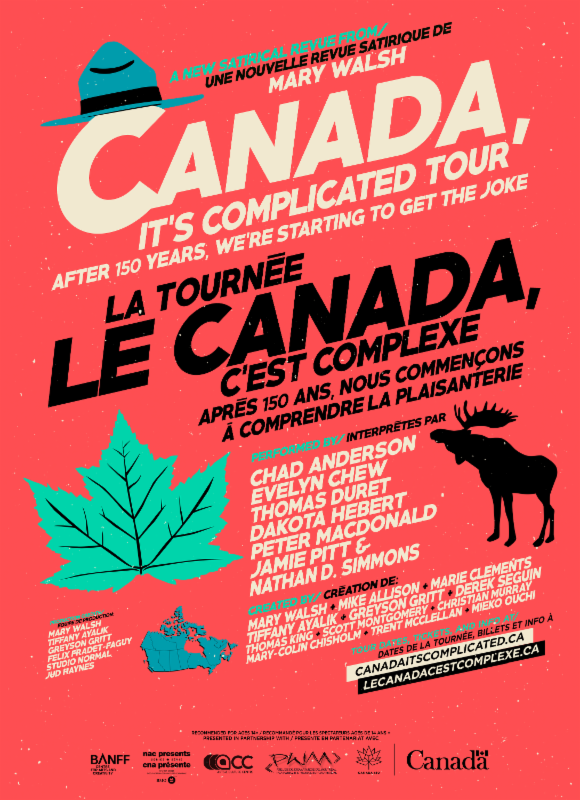 Canada, It’s Complicated comes to the Imperial Theatre on Thursday, September 21st at 7:30 pm. Tickets are $20 per person. This performance is recommended for children 14+. To book your tickets by phone call the Box Office (506) 674-4100. To book online: CLICK HERE The post Canada, It’s Complicated at Imperial Theatre appeared first on Giv'er Saint John. This is a syndicated post. You can view the original post here: Canada, It’s Complicated at Imperial Theatre.